How Does The EuroMillions Millionaire Raffle Work? Millionaires Raffle is an extra game added to every EuroMillions draw in the UK. It was first drawn on Friday 13th November 2009. There is one prize awarded of £1 Million (as you might expect given the name!). This is guaranteed to be paid out to one EuroMillions ticket holder in the UK each Tuesday and Friday. Which creates 2 new UK millionaires every week, regardless of who wins EuroMillions itself! Is It Really UK Only..? Yes - well sort of! 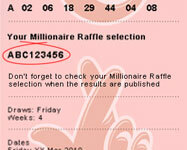 Only tickets bought in UK get allocated a Millionaire Raffle number. But if you're outside the UK and want to be included, read below for how you can. You simply buy a EuroMillions ticket. That's it. There are no numbers to pick or boxes to tick. You automatically get allocated a 'raffle number'. You get one unique number for each EuroMillions combination you buy - not just one per 'ticket' printed. So if you buy 5 combinations, your ticket should show 5 Raffle numbers too. One number is then randomly selected (by computer) from all those that have been given out. The holder of that unique number wins the £1 Million prize. What Do Raffle Numbers Look Like? Each number is completely unique. That's what makes this a raffle rather than a lottery. Ah, the most important question of all! This one confuses many players, because as we've covered this is not a lottery - it is a raffle. And like any raffle, the odds depend on the number of tickets that have been sold. Now the number of tickets sold does of course vary. Particularly in weeks when there is a big rollover - when a lot more tickets are sold. Remember, this game only applies to those tickets bought in the UK though. So you're NOT competing against all EuroMillions players! Now, EuroMillions tell me that they normally sell somewhere around 9 million tickets on a Friday, and 3.5 million on a Tuesday. So that means your odds for winning the £1 Million prize on Millionaire Raffle are about 1-in-9 million on a Friday, and 1-in-3.5 million on a Tuesday. And of course a lot higher when there is a big rollover and ticket sales rocket. The EuroMillions changes in May 2011 added the Tuesday draw. Which is why there are now 2 new millionaires per week instead of just 1. Here's more about the EuroMillions Millionaire Raffle Odds as a result of the change. There are also occasionally special draws with extra prizes given away. In May 2012 for example a special draw paid 18 prizes of £1 Million. To celebrate hosting the 2012 Olympics, the UK awarded an amazing 100 Millionaire Raffle prizes on 27th July! And as if that wasn't enough, they also held a special draw on both Christmas Day 2012, and New Years Day 2013. Both of these draws were also boosted up to 25 x £1 Million winners. So it is definitely worth watching out for these special draws as your odds of winning a big prize can greatly increase. Yes and no. The Raffle is a compulsory draw. You cannot choose if you want to play it or not - it was decided to automatically include it. And that increased the ticket price of EuroMillions in the UK from £1.50 to £2. So you are paying 50p to play in reality. But most people now seem very happy with the increase given the prize potential, and the odds of winning it. How Do I Play From Outside The UK? The secret is - get your tickets from the UK! Which is not difficult to do. You can't buy tickets from the main UK Lotto website unless you live in the UK already. So you can either ask a UK friend to get tickets for you. Or use an online syndicate that is based in the UK (as all their tickets will automatically include the Raffle game). Simply join one of the better online EuroMillions Syndicates in our list of reviews, and you'll be fine (the reviews state if tickets are bought in the UK or not). Luckily, it just so happens that many of the best online syndicates are either based in the UK or buy their tickets there. Making it easy to play this add-on game from almost anywhere in the world. The final way would be to use one of the many online ticket buying services. But this can be an expensive option. A 'reasonable' rate from these services is around 2-3 times normal ticket price. But it's not uncommon to see prices of 5-10 times normal price. So you have to be careful, and know what you are buying. And of course, you need to double check what country they source tickets from if you want to play Millionaires Raffle! Find out more about Euro Millions prizes (about the prize tiers, what you need to match to win, how big the prizes get etc), and more about how to buy EuroMillions tickets online, including some of the better value services you can use. Home > EuroMillions Syndicates > How Does The EuroMillions Millionaire Raffle Work? Why Only One Draw For The Lottery Jackpot?